I'm happy to say that the master bedroom only needed a little bit of picking up. Interested in doing yours but don't know where to start? Here is a detailed cleaning list of the Master Bedroom from my favourite cleaning gal, the FlyLady. I do cherish this space as my get away and relax space so it is a priority to keep tidy. There is only one before and after to illustrate this. I got the 2" blinds, windows washed and screens cleaned and I flipped the mattress plus got in along the edges of the baseboards and wiped them plus vacuumed really close. Nothing exciting to see but I know it's clean so I sleep better! How is your home coming this spring? 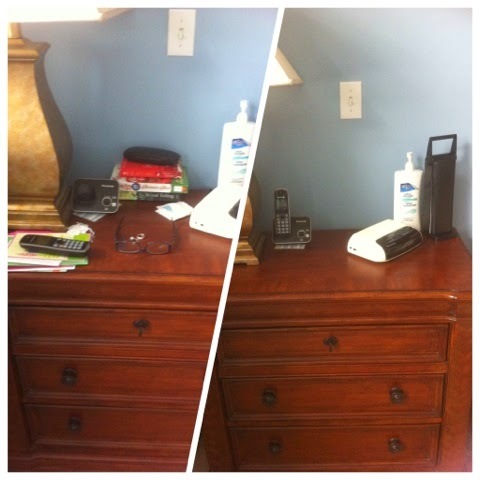 My night table before and after.